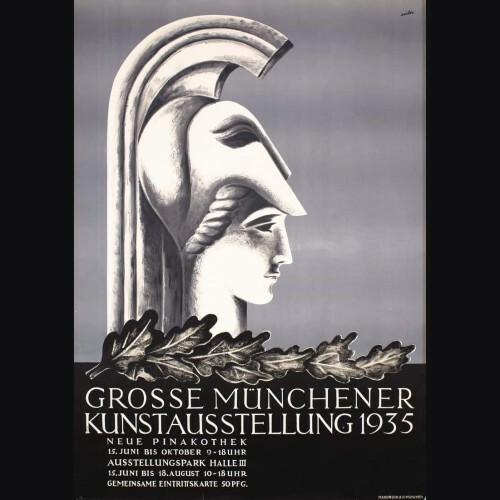 An original Munich art exhibition poster for the year 1935 designed by Anton Sailer. This example and the 1934 example I have offered were originally archived until the 1990's and are extremely rare. Aesthetically pleasing is an understatement with this and it is a beautiful poster. It is a large format poster at approx 4 x 3 feet and I will refrain from framing them as much as I would like to do it. I think the collector for these will not need a long description for it and it would look great in home or office and bears no symbols of the political party of the time. Description: Grosse Münchener Kunstausstellung. Artist: Sailer, Anton 1903 -. Printing/Date: Offset 1935. Size: 47.2 x 33 in. (120 x 84 cm). Printer: Mandruck AG, München. Condition Details: (A-/B+) small tears at the edges, two tiny paper losses in the bottom corners, minor browning from tape, plastic stripe adhered to the right edge on the back of the poster.